The Monty 3-D wheelchair mount has been designed for positioning communication devices and notebooks on wheelchairs. 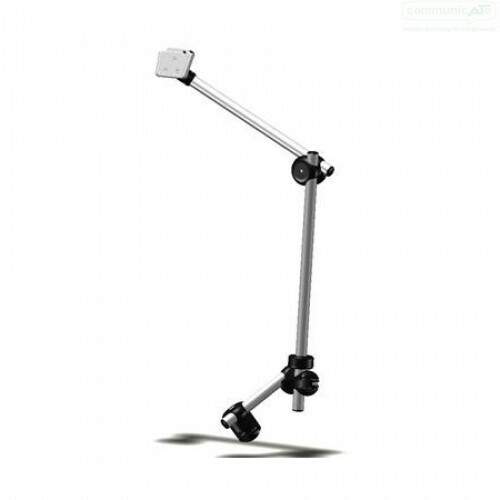 It's unique design allows for almost unlimited positioning options and it's made of light-weight materials. This model has Allen wrench adjustment only. The Monty 3-D K wheelchair mount has been designed for positioning communication devices and notebooks on wheelchairs. Removal of the mount from the wheelchair is quicly and easily perfromed by simply pulling upward on the vertical pole. The unique tube joints make it possible for the mount to be easily adjustable in any position 3-dimensionally. This mount has allen wrench screws ai its adjustable joints, helping to prevent unintentional adjustment of the best setup position. This Wheelchair mount has been designed for the use of communication devices, notebooks or tablets on the standard round tubular wheelchair frames. By changing the frame clamp it can be adapted to square frame as well as electric wheelchairs that have exisiting slot or track systems on their seat base. If ordering, ensure the frame clamp required is ordered at the same time, call Communicate AT for guidance if unsure.